Abdulhadi Al-Khawaja, renowned human rights advocate and past president of IFEX member the Bahrain Centre for Human Rights (BCHR) is entering his ninth week of a hunger strike in prison which he began on 8 February to protest a life sentence for peacefully expressing his right to freedom of expression. He pledged to continue his protest until "freedom or death." His life is now in serious danger and there may be irreparable damage to his health. 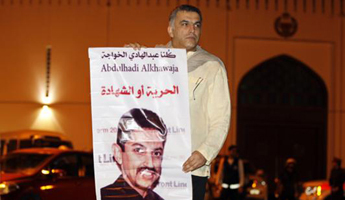 Sign this petition, started by BCHR President Nabeel Rajab, calling for the immediate release of Al-Khawaja. The international community must act together now to save Al-Khawaja's life. Al-Khawaja and another 20 activists, bloggers and human rights defenders were sentenced for their participation in peaceful protests last year. Al-Khawaja and several others were sentenced to life in prison, and 14 of them are in detention while the other seven were sentenced in absentia. There is no evidence that they advocated or carried out violence. They have alleged that they were tortured in detention and Al-Khawaja was treated for fractures to his face, among other abuses. The Court of Cassation, which is hearing the case on appeal, said it would announce a verdict on 23 April. After a hearing on 2 April, Al-Khawaja informed his family and lawyer that he would stop his glucose intake. Al-Khawaja's health is poor and he has already fallen in and out of consciousness. As a result, he was moved to the main prisoners' hospital at the Ministry of Interior's headquarters. In November 2011, the Bahrain Independent Commission of Inquiry (BICI), which was mandated by the King himself, called for all prisoners tried in military courts to be transferred to civilian courts and for investigations into allegations of torture. Despite these recommendations, human rights defenders, political activists and bloggers remain in jail or in hiding. Al-Khawaja is the founder of BCHR and the Gulf Center for Human Rights and a former Middle East and North Africa director of Front Line Defenders. He has also documented human rights abuses in Bahrain for international human rights groups such as Amnesty International and Human Rights Watch. Al-Khawaja is married and has four daughters. He lived in exile in Denmark for decades, and returned to Bahrain after the government announced a general amnesty in 2001. Story originally posted by IFEX.